Searchbinder is innovation technology that lets you instantly view all information about any person on social network websites. All you ever dreamed of is here. Enjoy receiving contacts of your friends and acquaintances by using our extension! Real-time information scanning: Searchbinder automatically scans users and displays contacts on their pages. Unlock access to all user’s contacts: social accounts, emails, and phone numbers. As simple as a touch: Searchbinder’s interface is very user-friendly, easy to understand and to work with. Bypass searching by or inputting any information: Searchbinder works without uploading any files, data, or contacts. No registration needed: just log into any supported website. Searchbinder works across all popular social networks. Open contacts of the celebrities that you subscribed to on Instagram or Twitter. View other social accounts of your colleagues, employees, or managers from LinkedIn. 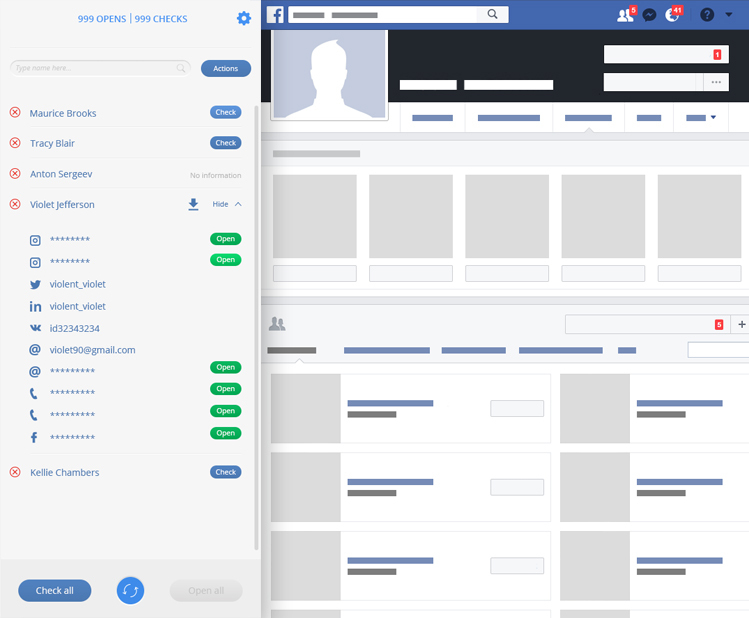 Get phone numbers or emails of your friends from Facebook and VK or simply unlock all contacts from strangers. Possibilities are limitless! Searchbinder runs on the most popular Internet browsers. Install Searchbinder on your Google Chrome browser by searching it in Google Chrome Web Store or simply by clicking the button below the Chrome icon. You can also enjoy using this extension with your Mozilla Firefox browser, click the button below the Firefox icon for more information.